Testing your pond will ensure your pond water is clean healthy for fish and plants. You should not only test your pond water before introducing fish, but also monitor it regularly throughout the year -- test every week from the beginning of May to the end of September, and periodically throughout the winter. With AquaChek Pond Test Strips, you can check your pond right in your own backyard in just minutes. It's simple -- just dip and read! You can then correct pond water imbalances before fish or plants are harmed. Total Ammonia High levels of Total Ammonia can be toxic to fish and plants. pH pH measures water acidity or alkalinity. Water that is too acidic can cause fish respiratory trouble and to become discolored, harm plants and increase the toxicity of Ammonia. Acidic water can also cause fish to gasp at the surface and reduce their resistance to disease. Buffering Capacity An adequate Buffering Capacity, or Total Alkalinity, prevents sudden pH changes that can cause stress to fish and plants. Factors such as rain, evaporation, photosynthesis of plants and ground water drainage all constantly affect the pH level of your pond. Nitrite High Nitrite levels can cause fish to become deprived of oxygen and discolored, and can contribute to rapid algae growth. Nitrate Proper Nitrate levels promote plant growth, while high levels may harm fish and lead to increased algae growth. 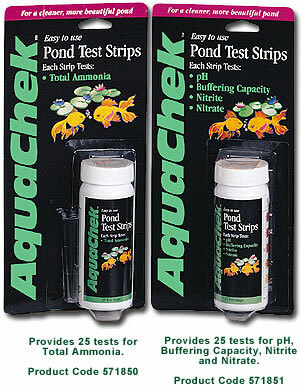 Test regularly with AquaChek Pond Test Strips to keep your pond healthy, well-balanced and safe for fish and plants.